Most people can’t see beyond tomorrow and act emotionally, while we need to act rationally and see the long-term consequences of our actions. Therefore, anybody that sees the need for the world to take an urgent action faces a difficult task when proposing pragmatic, fast and very radical changes to the ways the world is governed. It seems to me that the only realistic route for humans to take is to create a new organisation, which would have the capacity, resources and resolve to act on behalf of all of us in the hour of the emerging existential threat. To have any chance of successful delivery of its foremost objective, i.e. to protect Humanity against existential risks, such an organisation should have supranational powers exceeding any prerogatives of the existing international bodies, such as United Nations, NATO or WTO. We need an organization that would resemble the World Government. Only such an organisation, which should be operational by about 2030, would have some chance to mitigate not just global political and social risks but all other existential risks mentioned before. The agenda of such an organisation should be governed by one key issue: Fighting existential risks. Any other objectives are subordinate to that goal, since if there is no Humanity and no civilisation there is no point to discuss other aims of such an organisation. 2030 is a threshold date, because by then we must have a full control mechanism of AI in place. This objective is the driver for the entire the agenda of this website. 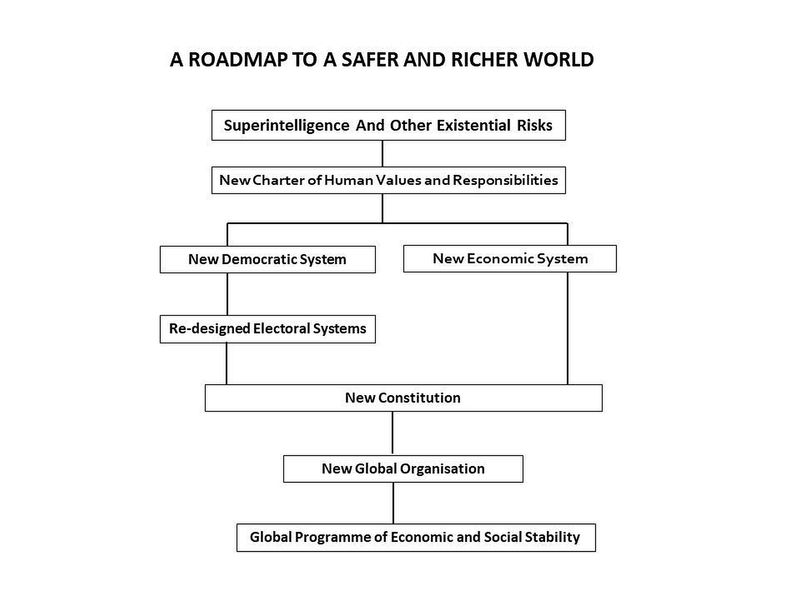 This chart shows the main areas that need to be fundamentally changed because of the threat from Superintelligence and other existential risks, culminating in creating a supranational governing organization that will lead us all through that perilous period. Now, the question is who could do it? What we are discussing here is how to guide Humanity and protect our civilisation in the next 20 years, while it passes through probably the most dangerous period in its history. By then Humanity could reach the point when it may already be coexisting with Superintelligence, which would hopefully act in unison with us, helping to sort out our problems. We are already late in creating such a large supranational organisation. Perhaps one of the reasons is that many of us still hope for the UN to take up such a role, or that the UN itself will be quickly transformed into such an organisation. After all, this is the organisation that should deal with existential risks in the first place. Unfortunately, this is also the organisation that indirectly increases the Humanity’s overall existential risk by being almost totally ineffective in solving grave problems. UN may be trying to apply some solutions but quite often when it is too late, or a grave human, economic and ecological danger has already been done. In most cases it is just incapable of solving the problems at all (e.g. Syria or Libya). The best evidence in my view is the creation by the UN of the International Strategy for Disaster Reduction (UNISDR) the organization that was established in 1999. It has had hardly any influence on any of the top ten existential risks listed earlier, apart from climate change and that was really managed by International Panel on Climate Change (IPCC). The reason behind that is simple. Such an organisation to act successfully would have needed the powers far superior than the UN has now. Since we know how embarrassingly ineffective the UN is, no wonder that the world is practically left to be gradually sucked into the funnel of ever growing existential risks. Initially this will be hardly visible but further into the future the risks will tend to combine. At that time there may be no organisation or a country powerful enough to stop the demise of our civilisation. Transforming UN into the World Government is also a futile hope, because of the very way the UN makes decisions – the unanimity voting. This is the same reason why the EU has been less effective than it could have been. Fortunately, the Lisbon Treaty has finally created a possibility for the European Council to vote using a qualified majority on more subject domains than ever before. Since the existential risks can materialize at any time, e.g. pandemics due to laboratory-generated bugs being maliciously released in the open, we should have an organization that could act as de facto World Government right now, at the latest by about 2030. I have already indicated in the previous chapter that creating the World Government from scratch in such a short time, even if it only included most, rather than all, countries, is not feasible. Therefore, the only way that could happen is by transforming an existing organisation, or empower a single large country with supranational powers, into the World Government. That new global organisation would gradually substitute the UN, based on a fundamental review of human values discussed in the next Part. So, we know now that it is unrealistic to create the World Government from scratch; it has to be formed from an existing organisation, whose scope and prerogatives must be greatly extended. But for such an organisation to be successful in mitigating existential risks it should have a mandate from all of us to act on our behalf. That of course will not happen. Even if there had been a world poll agreeing to establish it, that would certainly not come to fruition. Would those who hold power in autocratic or dictatorial regimes give up their privileges and introduce a democratic government as part of the World Government? Certainly not! It’s a pity but that is our world and our civilisation and perhaps that’s one of the reasons why we are in such an existential danger. Therefore, the only plausible solution, is to assume from the very start that any supranational organisation that is to be created will only include the majority of the nations but not all of them because there would simply be no agreement to do so. We see a similar scenario happening right now. The European Union wanted to go ahead and formalize a political Union, but the UK would never agree to it. That’s why it has decided to exit from the EU. That has motivated some of the remaining 27 EU countries to move ahead towards a federal European Union but those initial initiatives have been stalled by current events. We must remind ourselves again that we need the World Government for one key reason – to mitigate the existential risks that Humanity faces. One of these existential risks is the Global Disorder. To mitigate this existential risk we need to change entirely the way our civilization functions. That’s why we need create the world-wide organization with significant powers. The migration wave of 2015 into the EU is the best example of how quickly national opinions change and become deeply entrenched. Therefore, we must look at a candidate organization that would be capable to reduce the existential risks in general, but in particular, its capability to minimize the global social and political disorder. Such an organization would have to improve dramatically the coherence of objectives between the member states, and from a global perspective. Who has the best credential to become the de facto World Government? To make that assessment, we need to specify what would be the scope and prerogatives needed for such an organisation to be successful in mitigating existential risks, ignoring for now other objectives that it may have.That is covered in the next tab.